I enjoy living in the north east corner of Botswana, where my husband and I run our own business. 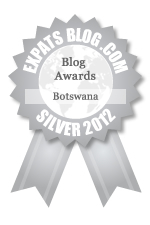 ExpatsBlog.com Expat Blog Awards 2012: Botswana Silver Award! This blog won the Silver Award for best expat blog in Botswana!